Top Recognition from Industry Experts. Gartner has once again named Sophos as a Leader in the Magic Quadrant for Unified Threat Management – for the sixth year in a row. 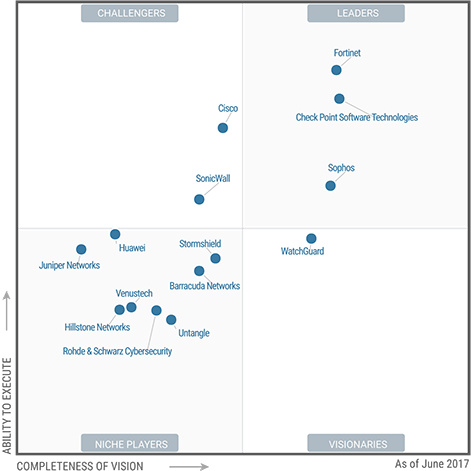 We are now one of only three vendors in the Leader’s Quadrant. Gartner has also named Sophos as a Visionary in the Magic Quadrant for Enterprise Firewalls which we believe confirms that XG Firewall is one of the best firewall solutions for businesses of all sizes. Additionally, Sophos is the only vendor to be a leader in both UTM and Endpoint Protection which we believe uniquely positions us to deliver on this next generation of Synchronized Security. user interface, full-featured protection, top performance, and tremendous value. firewall delivering unrivaled value with industry leading performance. Powerful, top-down inheritance based secure web gateway policy engine similar to dedicated enterprise SWG products, that makes it easy and intuitive to build sophisticated user and group based policies with custom actions and constraints. XG Firewall benefits from Synchronized Security – a best of breed security system where integrated products dynamically share threat, health, and security information. It means that if your Sophos firewall identifies a compromised endpoint or server via Sophos’ patented Security Heartbeat, the infected machine is isolated and its network access revoked until a cleanup can take place. The whole process is automated and lightning quick. So you get faster, better protection against advanced threats. Statements contained in this web page are based on publicly available information as of 17th of July, 2017. This web page has been prepared by Sophos and not the other listed vendors. The features or characteristics of the products under comparison, which may directly impact the accuracy or validity of this comparison, are subject to change. The information contained in this comparison is intended to provide broad understanding and knowledge of factual information of various products and may not be exhaustive. Anyone using the web page should make their own purchasing decision based on their requirements, and should also research original sources of information and not rely only on this comparison while selecting a product. Sophos makes no warranty as to the reliability, accuracy, usefulness, or completeness of this web page. The information in this web page is provided “as is” and without warranties of any kind, either expressed or implied. Sophos retains the right to modify or withdraw this web page at any time. Gartner does not endorse any vendor, product, or service depicted in its research publications, and does not advise technology users to select only those vendors with the highest ratings. Gartner research publications consist of the opinions of Gartner’s research organization and should not be construed as statements of fact. Gartner disclaims all warranties, expressed or implied, with respect to this research, including any warranties of merchantability or fitness for a particular purpose.